Epke Zonderland of the Netherlands. Germany's Images Maps Videos News Shopping More Chicago, IL Change location Search Options Show search tools Search Results Fabian Hambüchen. USA's Aly Raisman in movement. Raisman, with her arms up. "That was the most exciting final I&apos;ve ever seen," said Shannon (Miller? ), an Olympic commentator, on the men&apos;s bars. Whether or not that&apos;s incredibly hyperbolic, everyone did seem very happy for each other during these artistic portions -- especially those who were happy for themselves. 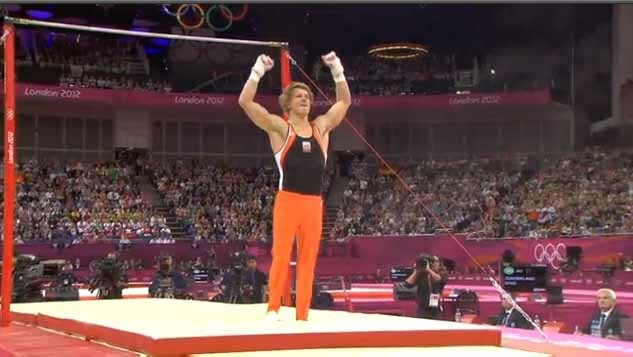 When a gymnast wins (or when they think they&apos;ve won), there&apos;s a certain "YEAH" quality to their final arms up, as seen below with Dutch gymnast Epke Zonderland, who just knew that he had nailed the gold when sticking the landing on bars. Grabbing silver was Germany&apos;s Fabian Hambüchen, who, before seeing Zonderland perform, thought he had nailed it. But when a gymnast finishes after doing poorly, there&apos;s a certain resignation in the arms, as seen below after Jordyn Weiber&apos;s floor routine, for which she did not medal. However Aly Raisman did, clinching gold. In second was Romania&apos;s Catalina Ponor, and Aliya Mustafina of Russia got bronze. *Note: These claims are entirely unscientific. There may be something in their eyes that indicates a win or a loss too.